Russell: Hi – you’re from San Francisco? Jeff: Yeah, sure am. You? Russell: We’re from Dallas. I guess you’re a 49ers (football) fan? Jeff: Yep… So you’re a Cowboys fan? Jeff: Hmm… (grinning) Yeah, I can’t walk with you. Russell: Definitely not. Buen Camino anyway though! Actually he was just being funny, since he was just sitting down and he saw that we were packed up and about to head out. But we saw him later the same day and ended up walking with him into Pamplona, and then had lunch with him there. We saw him a couple of other times as well, including several days later coming into Logroño, just after we all got drenched in the rainstorm (he was the one that was lucky enough to duck under an overpass and avoid it). On one of our last days, I had a feeling it might be the last time we saw each other, so we exchanged email addresses. We met so many people on the Camino — sometimes just for a few minutes, sometimes for longer, but most of them we’ll never see again. I’m glad we exchanged contact info with a few of the people we got to know fairly well. I want to make a point of doing that even more next year. I sent Jeff an email when we first got back, and he said he was still going strong. Today I wrote to him again on a whim, and he wrote back right away saying he arrived in Santiago yesterday morning. We connected on Facebook, and I saw all the pictures and videos he’s been posting along the way. 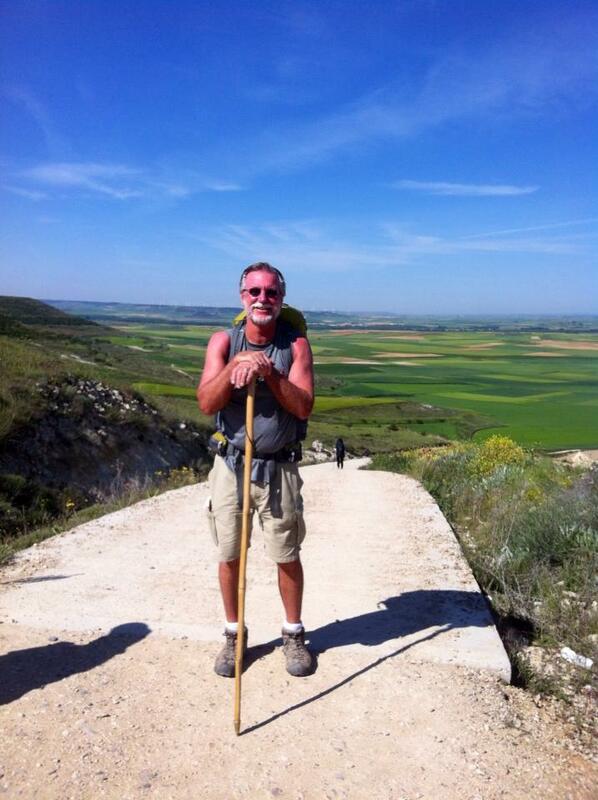 It turns out that yesterday was not only the day he finished the Camino, but also his 60th birthday. He was describing how excited he was, waking up on that last day and feeling like it was Christmas, eagerly waiting for the sun to come up so he could start walking the last leg to Santiago. And when he made it there, he was overcome with emotion as he walked through the archway into the square, and finally saw the cathedral in person. So it’s been almost a month since we got back from the Camino, and we’re definitely back into the normal work grind, with daily life sucking us in as expected. But if we’d continued walking for 39 days instead of 11, it’s possible we’d be arriving into Santiago about now too — and realizing that takes me right back onto that dirt track walking into that tiny little town all tired and hungry, and finding a little cafe attached to someone’s house, with delicious hot waffles with chocolate and whipped cream on top. I’m there, I can see the beautiful countryside, and I can taste the food. And I can imagine what it’ll be like when we finally walk through the archway into the square, and see the cathedral in Santiago for the first time ourselves. Buen Camino and Happy Birthday, Jeff — you made it!